In the late 16th century, the Dutch had thrown off Spanish control in Europe and entered into a period of frantic economic expansion. Amsterdam was the world financial center and the Dutch fleet the greatest in the world. Dutch ships were present in most ports of the known world, and Dutch captains were responsible for taking control of the Spice Islands (the Moluccas) in eastern Indonesia, and for discovering Australia and New Zealand. The Dutch East India Company was the powerful engine behind much of this activity, which included the voyage of Henry Hudson. With his crew of the Half Moon, Hudson explored the coastlines of northern North America in search of a Northwest Passage. His voyage up the river that would be named Hudson helped to change the European conception of the New World. To this point most explorers regarded America as simply an impediment that blocked them from the riches of the East. Hudson found a beautiful landscape, ample harbors, fertile valleys and, most important, an abundance of fur-bearing animals. The New World offered riches of its own. In 1621, a new trading firm was established: the Dutch West India Company, which was more willing to capitalize on the resources of North America than the East India Company had been. While expending most of its energy wresting colonies and riches from the Spanish, the West India Company systematically began to develop a fur trade. 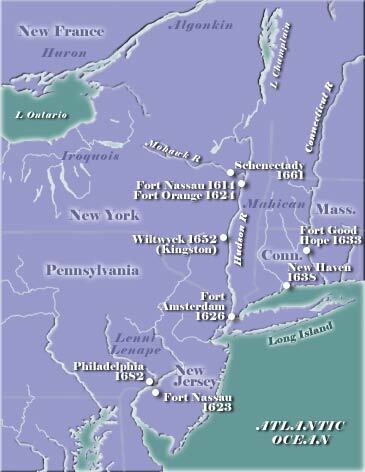 Outposts established on the Hudson, Mohawk, Delaware and Connecticut rivers served as centers of trade with Native Americans. Probably the most successful trading post was established at Fort Orange, site of latter-day Albany. In 1626, the settlement of New Amsterdam was established at the mouth of the Hudson River. Peter Minuit, director general of the company, purchased all of Manhattan Island from the local natives for 60 Dutch guilders, which some have calculated to equal $24. The village`s growth was slow, but the population was diverse from the beginning. Since Holland of the day was one of the most prosperous and desirable places in the world, a limited number of Dutch were attracted across the ocean. Instead, people of different nationalities searching for economic opportunities found new hope in New Amsterdam. From its earliest times, the town was a melting pot. No one ever confused early Boston with New Amsterdam. The latter was a seafarers` town, complete with a full complement of taverns and smugglers. Dutch control of the New Netherland lasted only about 50 years, but remnants of that time remain. Dutch settlers erected a stockade wall at what was then the northern edge of New Amsterdam, which later evolved into Wall Street. The Dutch villages of Haarlem and Breukelen would later become New York boroughs. Early Dutch farms, called bouweries, provided the name for the section of the city that would become the Bowery. In the countryside outside of New Amsterdam, things were somewhat different. To bolster Dutch control in the area, the West India Company created a patroon, or landowner, system that granted huge parcels of land and feudal rights to individuals who could finance the settlement of 50 adults. Land ownership was denied to common workers, who became tenant farmers. One of the most famous patroonships lay along the Hudson River. It was maintained by Kiliaen Van Rensselaer, a Dutch diamond merchant. The result of this system was the concentration of large blocks of land and exclusive political power in the hands of a few. This society was immortalized in Washington Irving`s History of New York. The patroon system lived on in New York into the early 19th century. Wee desire therefore in this case not to judge least we be judged, neither to condemn least we be condemned, but rather let every man stand or fall to his own Master. Wee are bounde by the law to do good unto all men, especially to those of the household of faith. The letter became known as the Flushing Remonstrance, and represents an early attempt to set out the principle of religious toleration. Meanwhile, English settlers were expanding into the New Netherland, forcing the Dutch out of New Hope in the Connecticut Valley and establishing new settlements on Long Island. In 1664, James, Duke of York and brother to King Charles II, asserted his claim to the entire region between the Connecticut and Delaware rivers. English troopships arrived in New Amsterdam harbor and prepared for battle. Stuyvesant bellowed orders to the citizens to defend the colony, but could not motivate them. The New Netherland became New York without a shot fired.